NEW ORLEANS - Dec. 31, 2018 - PRLog -- Q&A sessions with the stars of "Outlander," "The Walking Dead," "Luke Cage," "Charmed," "iZombie" and "Charmed," Mads Mikkelsen(Doctor Strange), Sean Gunn (Guardians of the Galaxy), Matt Ryan ("Constantine") and more, plus anime, video games, cosplayer and comics creator sessions, adult and kids costume contests and more highlight the programming offerings at Wizard World New Orleans, Friday through Sunday, at the New Orleans Ernest N. Morial Convention Center. Most programming is included as part of the standard event admission and is in addition to the live entertainment options (dancing, music, etc.) all weekend. • World-famous Wizard World Adult Costume Contest, Saturday at 7:30 p.m. and Kids Costume Contests on Saturday and Sunday at 2 p.m.
A full list of Wizard World New Orleans programming is available at http://wizardworld.com/programming-entertainment/new-orleans (subjects, guests, times and rooms subject to change). Wizard World events bring together thousands of fans of all ages to celebrate the best in pop culture: movies, television, gaming, live entertainment, comics, sci-fi, graphic novels, toys, original art, collectibles, contests and more. The first event scheduled on the 2019 Wizard World calendar, New Orleans show hours are Friday, January 4, 4-9 p.m.; Saturday, January 5, 10 a.m.-7 p.m.; Sunday, January 6, 10 a.m.-4 p.m. Kids 10 and under are admitted free with paid adult. Wizard World New Orleans is also the place for cosplay, with fans young and old showing off their best costumes throughout the event. Fans dressed as every imaginable character – and some never before dreamed – will roam the convention floor and participate in the famed Wizard World Costume Contest on Saturday evening. 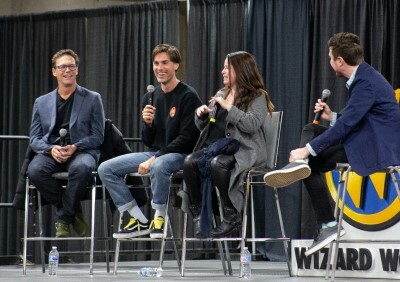 For more on the 2019 Wizard World New Orleans, visit http://wizardworld.com/comiccon/new-orleans.